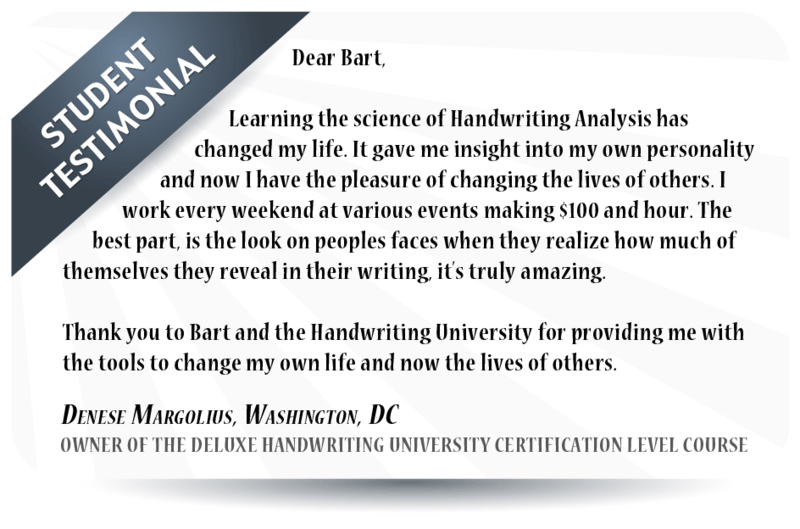 Finally, I’m sharing the psychological secrets to turn even the mildest interest in handwriting analysis into a lucrative full or part-time business by mastering this life changing skill. If you are fascinated with people, psychology and science of understanding personality this training is for you. After taking this course, you will have the ability to capture and express in words the essence of someone's core personality and their deepest wounds and motivations in life. Finally, You Have A Fast And Accurate Map of Anyone's Unconscious Mind Which Reveals Their Inner Most Desires, Fears, Personality Traits and True Motivations.... And You Have The Power To Change Them For Good. This is Brand New and enrollments are now open for the 2018. Classes will be full in the coming few months, so get started today during this promotional window. Make a full or part-time living through counseling, coaching, or helping companies select the right employee. You will be certified in this remarkable skill from the world's leading school of transformational handwriting analysis Handwriting University International. You will no longer have to ask "Why does he act that way?" or "Am I crazy or is she crazy?" You will know the answers and feel freedom and clarity about all your relationships in your life. We have had people on the waiting list for six months because this is the most in-depth Certification Level Course available to become a world class personality profiler using the map of handwriting analysis and the tool of deep personal change called graphs-therapy. I'm sharing the psychological and personal transformation secrets I've spent over three decades and tens of thousands of dollars researching. Plus, this new completely revised version contains videos and lessons hand-selected from over 15 years of live conferences and private invite-only trainings held from Dallas, Texas to Mumbai India. You will see only the "best of the best" in videos, audios, and life changing lectures that take you deep into the human experience. Some people think handwriting analysis is just about handwriting. Whether you are interesting in understanding yourself and how you can experience more success, happiness, or love life this course covers it all and much more. Many entrepreneurs and professionals choose to take this course to help better screen and select employees. Other graduates have found applications in their counseling and life and business coaching practices. In fact, if you enroll during this promotional period, you will be getting full access to our 401 Level Business Training which turns this skill into a part-time income. Before next year, you can have clients lining up to pay you $300-$1000 a month to be their personal "Life Design Coach." Naturally, an expertise in handwriting analysis makes the all the sessions more effective and personalized. The PRISM coaching method stands for Purpose Relationships Identify Success and Meaning. This system walks the client through discovering their deepest meaning in life and designing a life (health, career, relationship) that is aligned with their highest values. It is a remarkable system that everyone could benefit from. Once you master this coaching system... you have all the tools you need to make a living from home and change lives! Everyone uses the deep insights to make their own life and the life of their family better within weeks of learning the key elements. You will be able to look at handwriting and make startling and 100% accurate observations just after the 1st module. Upon graduation, you will have the skill to predict relationship disaster or put the right employee for the job every time. your friends and impress even impress the most critical skeptic. The days of boring DVD and classroom learning are over. and take online quizzes throughout the program to test your progress. Get your own private Authorized Mentor to support you as you learn in short 15-30 minute sessions every week via phone or skype. Learn Grapho-Therapy from the new insights of modern brain research, MRI brain scans, and even learn how one handwriting stroke brought back the ability to speak from a brain injured man who suffered a head on collision. Just 30 days of brain retraining using this one method changed everything. you can change lives with this structured technique. Whether you are new to handwriting analysis, or you think you already know a lot on the topic. We promise this course will erase the confusion of poorly written books and make you dead-on-accurate with every handwriting sample you ever look at again. 17. Over 20 hours of classic mp3 audio lectures from the past 2 decades of trainings. And, when you have completed all 17 modules, you can sit for your final exam and get certified! The insight you can gain once you learn all the primary traits and start putting them together will give you a hidden power that will mystify your friends and guarantee you will always be the most interesting person in the room. Get certified in 6-12 months inside this online course with the one-on-one help of an Authorized Mentor. While most of the courses is accessible online, you are shipped a few key items to your door. Get full access to the online training course, the handwriting university community, and textbooks shipped to your door. The only thing missing from this enrollment option is the personal guidance of an Authorized Mentor to support you when you need it. If you can self-study, this option will get you the knowledge you need to become certified. Please call our kind and patience customer support team which can answer most of your questions before and after you get enrolled. 1-310-684-3489 Ext. 5 Marie 6am-1pm. PST. Work Time Varies. Book an appointment to talk to our staff right now using this calendar booking system.